Find inspiration and instruction with Creativebug video classes, now online 24/7 @ your library. 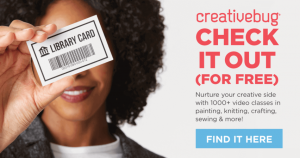 Creativebug has more than 1,000 award-winning art & craft video classes taught by recognized design experts and artists, and is a top resource for DIY, crafters and makers. Enjoy guilt-free inspirational screen time with unlimited access!